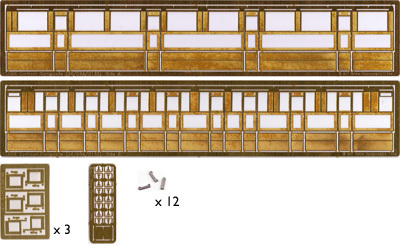 This range of etched sides can be used with other parts from the MJT range to create a metal model of a Gresley teak bodied coach. Alternatively they can be used as the basis of a scratch built model or to adapt a suitable donor vehicle (see for example Model Rail February 2006 - Done in a Trice). The sides are 'multi layered' allowing detail such as beading to be represented accurately. Cast door ventilator hoods, etched hinges and handles are supplied with the sides. Vehicles can be made to complement other proprietary offerings so that authentic express formations can be modelled. The instructions give details of build dates, livery, numbering, etc. These vehicles were built between 1926 and 1940 and feature both turnbuckle and angle iron trussing. One of the first class compartments was shorter than the others having only three seats arranged on one side only.